We not only provide elegant and luxurious accommodation but dining at Resort Terra Paraiso is a gastronomic journey in itself. There is choice for everyone to pamper their taste buds. Our aesthetic and exclusively decorated multi-cuisine Bar & Restaurant ‘Blue Bristo’ offers the best of world and international cuisines. A skilled culinary team of chefs, inventive cuisine and a variety of dining choices have earned our resort a reputation for excellence in dining. Delight your taste buds with entrees that vary from the very rich to the lightest of cuisine. Choose from Goan cuisine of fresh seafood, coupled with locally grown fruits and vegetables, to pasta, sizzlers and everything in between. Blue Bristo serves delectable International & Indian Cuisines which is open for breakfast, lunch and dinner .Here you can enjoy poolside all day dining at this restaurant offering Indian, Chinese, Continental and Italian cuisines. 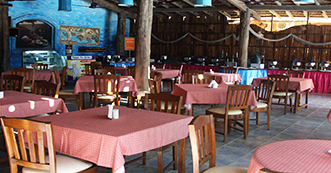 As can be expected our restaurant specializes in Goan delights and offers the best you can get Fish Curry and Prawn Curry Rice.